On day 34 of my rejection therapy, I went out and looked for a job, and got it at BigCommerce, an Austin-based eCommerce and web hosting company. Today, I reported for duty and had my one day employment there. My day at BigCommerce can be described as fun, engaging and surprisingly emotional. I knew the company is a good place to work just based on my interaction with the kind and gregarious Jennifer. What I didn't know was the company's family-like culture. People were extremely hospitable to me, chatting with me about my experience and sharing why they are proud to be a BigCommerce employee. 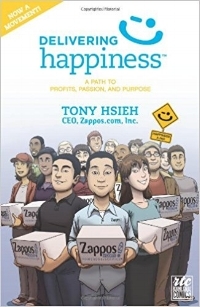 As a proponent of strong company culture, illustrated in Tony Hsieh's book - Delivering Happiness, I was very delighted to witness the pride and mission BigCommerce employees showed. Yes they are a high-growth business whose goal is to make money, but they also possess a desire to empower their customers to make them successful. At the end of the day, the company held a All-hands meeting, where all Austin-based employees shared their news and thoughts with each other. There was one employee talked about his family going through tough times due to his wife's illness. He held back tears while describing how the company is like his family in pulling him through the hardship. I have been to many company all-hands and culture-talks, but I haven't seen anything so human and so genuine like what I witnessed that day. If you are a business owner and would like to build an online store, I would highly recommend BigCommerce. You will be in good hands. About rejection therapy - at the end of the day, I gave a speech on my journey, the topic of 'rejection', and good customer service. It was very well received and we all shared insights and laughters together. I also requested to have my picture to appear on BigCommerce.com. The idea was from Cori Carroll from Florida, and it was ingenious. BigCommerce actually followed through on the request and put me on their homepage. Learning: as a business, if you are generous and genuine to your employees, they will have exceptionally high morale and pride, and bring happiness to your customers. If not, don't be surprised to be rejected by both of them.